We received the best phone call the other day.... Some random guy (Taffy Shop's new best friend) called in and said he was having a debate with a friend that needed settling right away so he called the Taffy Shop to settle it once and for all. He had us intrigued! Jed, our "Ambassador of Quan" when it comes to salt water taffy tasting,.....we can hear him now, "Show me the taffy!" (Go watch Jerry Maguire if that just went over your head. We recommend the edited version if you can find it) ;o) .....anyway, where were we? Oh yeah, Jed answered that phone call and lets just say the stars aligned when he was the one that picked it up.... this call was made just for him! So Jed replied to our answer seeker, "How do YOU eat salt water taffy?" The guys response was, "I think you chew it and leave it in your mouth to dissolve, which could take up to 30 minutes. But my friend thinks that you just chew the taffy and then just swallow it. So? How do you really eat it?" Jed's response was classic! He said, "Well, it all comes down to self control. If you're like me, you pound it down until you realize you're at the bottom of the bag and then you start savoring every piece. So in a way, you're both right. But ultimately, you need to understand your own way of eating it so you can buy it according to your needs." Our new friend thought that was awesome and laughed at the thought. Then Jed said that we may just have to write a blog about this phone call. Our friend asked if we could give him a shout-out when we do. So andrewcool24 and foxy.fawn ..... here's your shout-out! So, how do YOU eat salt water taffy? Do you treat it like a bop-it toy and pull it, twist it, bop it.....and then pop it in your mouth? Maybe you like to treat it like play-dough and make something with it before you devour it. Or maybe you just let it dissolve in your mouth, just like our new friend and savor every last second of it while drool seeps from the corners of your mouth because of the delicious goodness that is our taffy. We recommend all of the above. There really is no wrong way to eat a piece of taffy. But we give super props to anyone that can keep it in their mouth without eating it for longer than it takes to chew it. Man, I just can't. One down and the next wrapper is already open! That's how WE roll around here! How you eat salt water taffy is as unique as you!..... We recommend by the piece, by the pound or by the boat load of goodness that comes in our 5 lb. bag! Now, go get your taffy on! 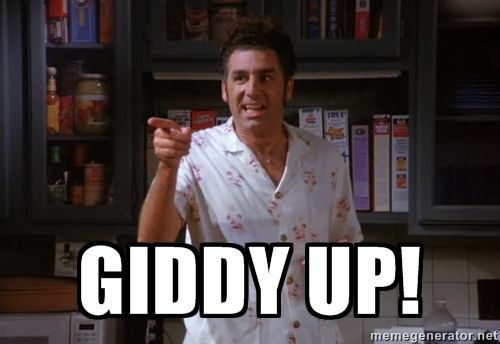 Giddy up!